Tandoori chicken in an oven?? ?Sounds funny right?? I too was under the same impression,how can you make tandoori without a tandoor but sadly I was mistaken.Tandoori chicken has been always my favourite when ever we used to dine out when I was in Delhi.So,I happened to browse through this recipe from Vah Reh Vah where Sanjay explains clearly this recipe in an oven.I was very much impressed and the very day I bookmarked this and tried it out after waiting patiently 8 hours marinating the chicken . The result is all in pictures ,all at home had a gala time,enjoyed it !! Wash and clean the chicken ,drain water.Pat dry on a paper towel. Pierce with fork all around the drumstick/ thighs and make gashes reaching till the bone. Marinate first using half of chilly powder,salt and lime juice applying inside the gashes. Make a paste using all the other ingredients except oil and apply evenly on all sides reaching everywhere.Pour oil at the end and mix well. Brush the top with oil and place it in the oven for 25 -30 minutes on one side and 20- 25 minutes on the other side after turning it up. Serve hot with onion rings,lemon wedges and sprigs of cilantro. * You can squeeze lime and add a pinch of chaat masala which I have not done to add additional flavor. * You can omit the addition of oil ,only drawback is you get a dry outer cover.I tried it that way too. Colourful and delicious tandoori chicken pieces Dear.Neat recipe.Luv it. Oh looks sooo delicious Julie..
Hi julie, now i can learn to make tandoori chicken in an oven from you. Tandoori chicken is my fav too..I too grill it in the oven ....Yours looks extremely yummy!! ok am coming over to your place ......its too good just to look at !!! Julie, I'm drooling. Tandoori chicken luks yumm. I too make it in oven and I use Shaan Tandoori masala along with other spices which gives the chicken color and nice flavor as well..
yummy and colorful chicken,my son's fav..
looks so yummy and tempting...well done and i am inviting myself to your place...super good Julie!!! mouthwatering chicken, looks super delicious, love tandoori style and i make tandoori soya.. 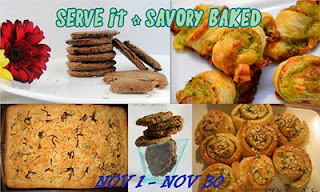 Perfectly done... you could send this to the baked event happening at our space..
yummy and delicious. I am slowly becoming your fan for non-veg food. looks delicious... we make it slightly differently at home... must try this version too..
i like tandoori chicken too, bookmarked your recipe. Thanks for sharing. Looks perfect Julie..Love to have those in one sitting.Yum ! mmm... perfectly cooked tandoori chicken. Bookmarked this. Slurp! It's aromatic and so juicy! I would love to have a piece! it took me down memory lane...my mom used to make this chicken in our small round oven! Thanks for visiting and following my blog. I've been trying to follow your blog, but couldn't find the follower gadget on your site. Please check. Thank you. Good recipe! Being a vegetarian, I'll probably try this with paneer :) The marinade sounds yummy! the dish looks really yumm and i am big follower of you ..keep visiting to my blog too..thank u for visiting . each comments make me feel so motivated to experiment with new one . Thank you all dear friends for the shower of inspiring comments!! wow! mouthwatering!! I shd try this sometime!